Richard Dawkins is dismissive of the concept of Islamophobia and declared: "I’m always being accused of Islamophobia, that’s a non-word." Question: Is Richard Dawkins a man filled with courage, truth, and conviction or is he a cowardly, agnostic pantywaist who is afraid of Islam? First, we found out that Richard Dawkins abandoned his militant atheism and became an agnostic (see: Richard Dawkins and agnosticism). Stephen Colbert declared: "What is an agnostic but an atheist without any balls?" Richard Dawkins lacks machismo? Of course, no man with machismo fears Islam and there is ample evidence that Richard Dawkins has an extreme case of Islamophobia (See: Richard Dawkins and Islamophobia). Richard Dawkins is dismissive of the concept of Islamophobia and declared: "I’m always being accused of Islamophobia, that’s a non-word." Dawkins' denial that the word Islamophobia is a word in the English language is a classic case of a man living in denial. Whether or not not Dawkins' fans wish to admit or not, Dawkins turns into a quivering bowl of jelly whenever he sees burkas, hookah bars, figs, dates, shish kebabs and camels! Of course, this further proves that Richard Dawkins lacks machismo! (See: Does Richard Dawkins have machismo?). 5 Don't miss this picture with a caption! Richard Dawkins "Dear Muslima" Elevatorgate letter sparked a large wave of criticism from individuals within the secular population who felt he was trivializing misogny within the secular community (see: Elevatorgate news stories). 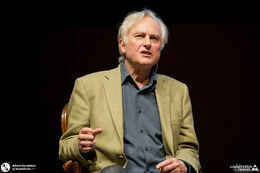 As a result of Elevatorgate controversy, Dawkins saw a large loss of influence within the secular population and the public at large (see: Richard Dawkins' loss of influence). According to the web traffic tracking company Quantcast, the web traffic of Richard Dawkins's website fell in 2012. By October of 2014, the web traffic for his website fell to a lower level according to Quantcast. The website traffic is measured via Quantcast which directly measures Dawkins' website traffic via embedded code on his website. The above graph shows the monthly website traffic to Richard Dawkins' website as of June 22, 2015 in terms of unique monthly web visitors. As you can see above, in 2012, Richard Dawkins saw a very large decrease in web traffic. After his defeat at the Battle of Waterloo and subsequent exile, Napoléon Bonaparte was never able to regain power. The same is true of Dawkins' Elevatorgate defeat at the hands of feminists. If only Richard Dawkins wasn't obsessed with Muslims, his Elevatorgate Waterloo could have been avoided! Like the evolutionist Adolf Hitler, Dawkins made the mistake of conducting a multi-front war. Dawkins was a such an eager beaver to attack the Muslims on his right flank, that he completely forgot about the feminists on his left flank. No doubt he thought his "Dear Muslima" letter was a rhetorical triumph over the Islamic world he finished typing it into his laptop, but little did he know, it would prove to be his undoing. Yes my atheist and agnostic friends, Dawkins was no match for the feminists, Muslims and Muslim sympathizers! Would Napoleon Bonaparte complain about being bullied by women? After his defeat at the Battle of Waterloo and his subsequent exile, Napoléon Bonaparte was never able to regain power. The same is true of Dawkins' Elevatorgate defeat at the hands of feminists. However, unlike Bonaparte who took his defeat like a man, Dawkins pleaded with the feminists to keep a stiff upper lip and suffer the unwanted sexual advances by atheist men like a man. But they just wouldn't listen. Why Can't a Woman Be More Like a Man?, Dawkins asked himself repeatedly. And unlike Bonaparte, Dawkins whined about his defeat. Dawkins retracted his apology to the feminists and then complained about being muzzled and bullied by feminist women. He trailed off momentarily, gazing at his hands resting on a patio table. Recent criticism of Dawkins has come from women, many of them within the atheist movement, which has long drawn more men to its ranks. His online remarks, some women say, contribute to a climate they see as unwelcoming to female atheists. Writing for Salon last month, atheist activist Amanda Marcotte said: “People like Dawkins . are the public face of atheism. And that public face is one that is defensively and irrationally sexist..."
Question: What real men complains about being bullied by women! Would Napoléon Bonaparte complain about being bullied by women? Godless men and women, just admit it: Richard Dawkins, the champion of militant agnosticism, is a girly-man! The mullahs laugh at the "superior new atheist intellect" of Richard Dawkins. Dawkins was defeated by feminist women thanks to his obsession with Muslims! And to the best of the mullahs' knowledge, unlike some Muslims, Richard Dawkins has never been awarded a Nobel prize in science! See also: The day Elevatorgate occurred has been called the day the atheist movement died. Due to his Islamophobia, has Richard Dawkins begun to distrust Barack Hussein Obama? Despite Dawkins' Islamophobia, I thought they were both liberals! There you have it folks! What more proof do we need? Cased closed: "secret Islamacists infiltration of the Obama administration". Checkmate Dawkins detractors and atheist Muslim sympathizers! Barack Hussein Obama has been busted! As can be seen HERE and HERE and HERE, the Islamacists in Saudi Arabia, Afghanistan and Pakistan have completely squashed what little interest there was in Richard Dawkins. No doubt the Islamacists were assisted by the Barack Hussein Obama administration which was secretly infiltrated by Muslims! We know that history is not Dawkins' strong suit nor is the strong suit of many atheists. Has Richard Dawkins' Islamophobia turned him into a conspiracy nut? John Lennox pointed out to New Atheist Richard Dawkins that Dawkins claimed in his book The God Delusion that Jesus may have never existed and that Dawkins errantly claimed that ancient historians have some disagreement on whether Jesus existed or not. After some additional discussion with Dawkins, Dawkins conceded that Jesus existed and said, "I take that back. Jesus existed". Although Richard Dawkins changed course in his debate with John Lennox and admitted that Jesus existed, as far as the resurrection of Jesus Christ, does Dawkins believe that Jesus' apostles died for a lie due to a conspiracy? Don't miss this picture with a caption! Richard Dawkins hiding from the British Muslim horde. Unfortunately for Richard Dawkins, his neighborhood has been turned into a no-go zone due to mean-spirited Muslims wishing to intensify his Islamophobia. If only the irreligious didn't have a sub-replacement level of fertility. Then godless Britain wouldn't have to import so many Muslims! ↑ Stephen Colbert - What is an agnostic but an atheist without any balls? ↑ Mohammad Abdus Salam was awarded a Noble prize in physics. Ahmed Zewail and Aziz Sancar were awarded Nobel prizes due to their work in chemistry. This page was last modified on 3 April 2017, at 06:46. This page has been accessed 9,223 times.